It is an honour and a pleasure to be here at the Chinese Academy of Social Sciences. Over the past four decades, the Queen and I have had the opportunity and privilege to pay four official visits to China. The great contrasts within your country, the diversity of its landscapes, and the richness of your culture never cease to fascinate us. Through these decades, from the first visit in 1985, then again in 1997, in 2008, and now in 2018, we have witnessed China opening up to the world and gaining prosperity. We commend China for its achievements. Thanks to the Chinese people’s determination and hard work, you have reduced poverty on an unprecedented scale. The goal you have set for 2020 is not only to eradicate poverty, but to build a 'moderately prosperous society in all respects’. At first glance, some might think that this is a modest goal. However, it reflects the understanding deeply rooted in Chinese culture and experience that prosperity is not just a question of individual income. This is a much more ambitious goal. You are aiming for better welfare for all. This is a goal shared by both our countries. And this is why our top experts have gathered here today at the prestigious Chinese Academy for Social Sciences for a fruitful discussion about exchange of ideas on common challenges related to the welfare state. Our nations may have different histories and cultures. But one of the things that make our nations great and unite us is the ambition to create welfare for all. In this process, we wish to learn from each other. This commitment goes beyond our own societies. We are part of a global community – and we share global concerns. The Sustainable Development Goals – agreed upon by world leaders in 2015 – have brought all countries together in a joint effort. The goals highlight the fact that every country has areas of improvement and needs to take action. The consensus on these goals is particularly important at a time when the principles of multilateral order and cooperation are being questioned. We will never achieve this set of goals without global cooperation. Indeed, strengthening and revitalising the global partnership for sustainable development is a goal in itself. At the same time, we should not underestimate the importance that one country’s efforts can have. The action taken by China has been pivotal. No country has contributed more to Goal number one: ‘End poverty in all its forms everywhere’. Fighting climate change is a top priority for both China and Norway. The world is looking to China, because the steps you take here have a huge impact. I am pleased that we share a strong commitment to the environment, and that we are working together in several areas, not least ocean protection. China and Norway also share concerns about the sustainability of our welfare systems. Like many other countries, Norway is facing an ageing population. This is a challenge for our economy, which depends on a large and highly productive workforce that shares the costs of welfare through taxation. Looking back, I can see the huge changes that my own country has experienced during my lifetime. I am convinced that the progress Norway has made would not have been possible without hard work, a shared sense of purpose and prudent national strategies. Developing a strong welfare state in the post war period was one of these strategies. I mention this because Norwegian social scientists played a vital role in designing economic and social reforms that helped to create enthusiasm, a common purpose, and confidence in society and the state. Reforms that brought our country forward. We need knowledge to make better societies. This should be a personal challenge for everyone here today. Many factors are important for a prosperous state. Norway has always been blessed by nature, from rich fisheries to hydroelectric energy and offshore oil and gas. For many countries, however, natural resources have become a curse rather than a blessing. To ensure that natural resources benefit the whole of society, we are dependent on sound management and good governance. This requires good planning and political will. Gender equality is a key factor for prosperity. Recognising that men and women have equal rights and ensuring equal opportunities is vital for an inclusive and just society. In Norway, we have developed generous systems of parental leave and childcare. In fact, we have found that the value of Norwegian women’s participation in the work force is equal to the revenue from our oil resources. I understand that China has a similar level of women’s participation in the work force. We know that some think good welfare systems are just an expense, but really they are an investment. Access to free schooling and generous financial support for students in higher education, regardless of gender and family background, is vital. This helps increasing productivity and moving us higher up on the global value chain. I have great hopes for our younger generation. I still have many dreams for the future. I believe we all dream of a better future for our sons and daughters. And for our grandchildren. We want them to have opportunities we did not get, to take chances that we did not dare to take, to succeed where we failed. We want them to learn from our mistakes. Finally, I would like to remind all of you who are students and researchers of how important it is to think independently, to work in teams, and to gain cross-cultural understanding. You all have the potential to make a real difference, to help build an even better future for the coming generations. With these words, I wish you all an interesting and inspiring seminar. 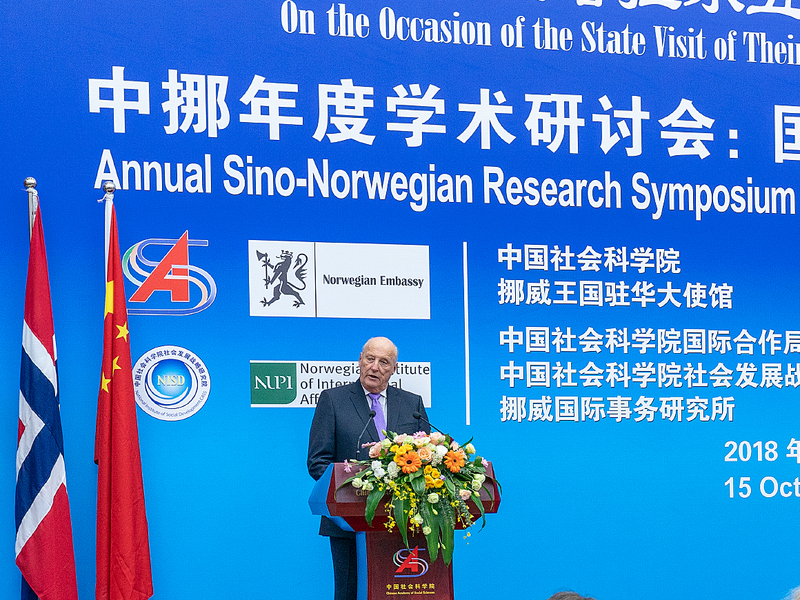 It is a great pleasure to declare the Sino-Norwegian social science symposium open.